Santorini. The name has an Italian lilt, the place is a beautiful Greek island. Will it disappoint? Can it be as sublime as the shots on Instagram? Booking a holiday on a dream Mediterranean island, there is always that nagging worry that paradise will not be up to par. Would Santorini, that archetypal Greek island, be as beautiful as every picture on social media? Pictures had been flooding my Instagram feed for quite a while. So, encouraged by friends, my family booked the trip in summer 2017. We remained optimistic but made sure that we had a comfortable hotel. If all else failed, and the place was overrun with tourist hordes, there would be the consolation of a pool with a view. Unfortunately, when we arrived, we realized this pool was outside the hotel and we had to walk a little in order to get there. However, I was yet to find out that an amazing trip was ahead of me. Santorini is a three-hour ferry ride from Paros. Upon arrival, I was amazed how such a small island could have such a big impression. Once we got off the ferry, we still had to take the bus to get to Oia. This lovely coastline town is on the northwestern tip of Santorini. Becoming aware of my surroundings, I felt as if I was this tiny little person in the middle of this huge volcano that was around us. Once we arrived in Oia, we first decided to walk down the famous 588 steps leading down to Old Port. We decided to go swimming in a small port called Ammoudi Bay. This bay had some of the clearest water I have ever seen. Also, you can find incredible cliff jumping spots here. The view was stunning and it was surprising to be swimming knowing that we were surrounded by a volcano. It was actually the first real moment where I felt I was in a unique place far from everything. After this long and sunny afternoon, we decided to get ready to go find a dinner spot. We got food from a little pita place that was located in the center of the village. The menu was simple, as it only had pita, but the place was packed with tourists. Santorini is a small village where the streets are very narrow but lovely and full of charm. There are plenty of tourist shops and some pretty nice galleries. We continued to walk about the streets of Oia with no particular destination. We discovered cute little shops that were all painted in light colors which makes this place very lively. 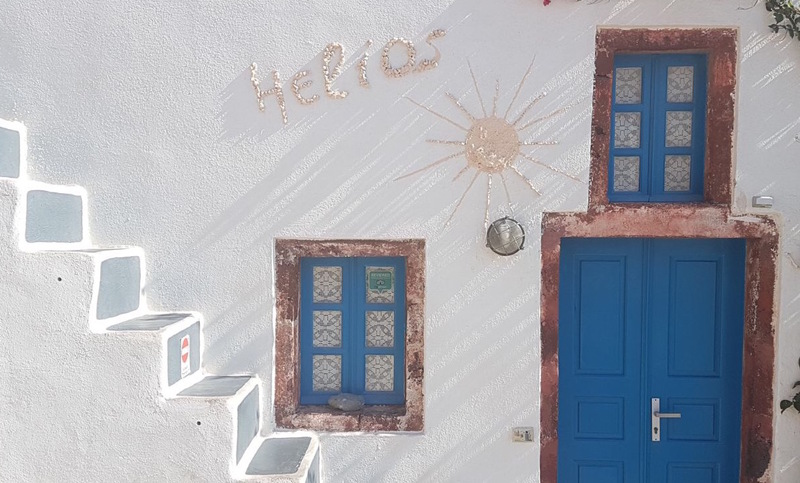 When people think about Santorini, the bright blue ocean and white dome rooftops immediately comes to mind. However, as I got to stroll through the city, I realized there is so much more to this island than the pictures that flooded my Instagram feed. 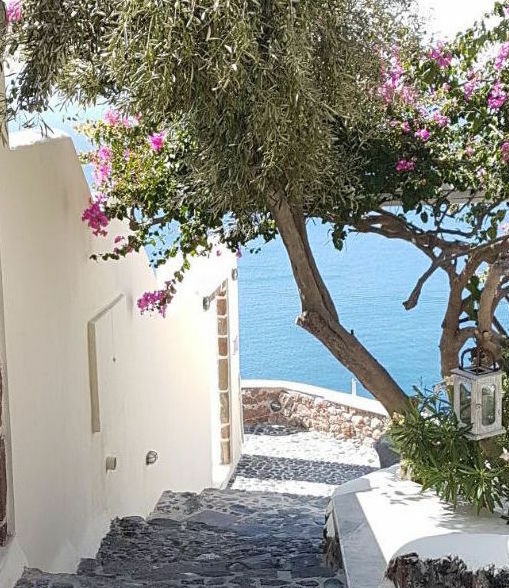 Before traveling to Santorini, I would always ask myself one question: Is the island going to be as good as my expectations set by social media? Roaming through the town and overlooking the volcano, I realized that it was even more magical than my expectations before arriving. Now that time has passed, I sometimes don't realize how this little island could be this fascinating. I have also realized that some beauty can't be captured through pictures, and you simply can't have the same experience I had while looking at your phone screen. I got to experience the real beauty of Santorini. One of my favorite parts of the trip was watching the sunset from the ruins of The Castle of Oia. 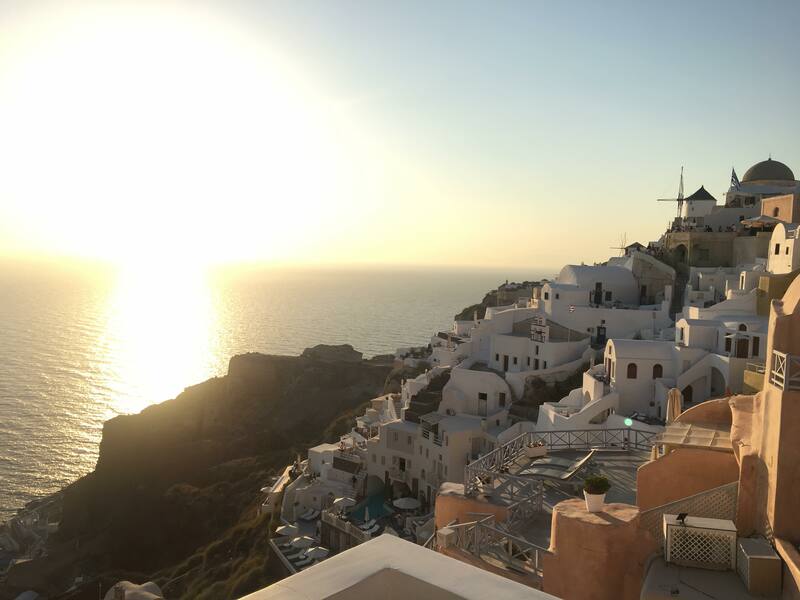 Many believe that this is the best place to see the sunset in Santorini. To get a good spot, it is important to go early before it gets too crowded. I watched the colors in the sky turn from orange and pink to complete darkness. Once darkness fell, the houses all light up and the city continued to stay alive. One of the things that makes a memorable trip, is when the trip is even better than what you expected before visiting. I had this experience while visiting Santorini. If you travel to this island, you will not be disappointed. It really is as wonderful as you imagine. I encourage you to roam the streets and explore every part of the island. Find your own favorite sunset spot and enjoy a drink while watching the sun change colors in the west.